A bill seeking the establishment of the Maritime University of Nigeria has been stepped down on the floor of the Senate. The sponsor of the bill, Senator James Manager, had told his colleagues that the establishment of the institution would bridge the manpower gap experienced in the maritime sector for skilled personnel. “The sector is dominate today by foreign interests. The very few professionals were trained abroad. “The question is; why do we not have a university for that purpose? “This bill provides the requisite opportunity and the enactment of this bill will help in transforming the educational fortunes in Nigeria and in producing the desire manpower and expertise now that Nigeria is yearning for local content in the industry following the passage of Local Content Development Act into law,” he stressed. Another Senator, Paulker Emmanuel, supported the motion. 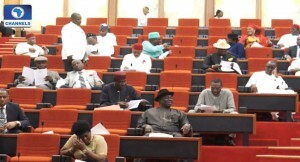 After debate on the motion with most of the senators asked for an upgrade of the Maritime Academy in Oron, Akwa Ibom State, rather than invest in another institution, Senator Manager asked for time to consult with his colleagues on the matter. It is over a year since the ground breaking ceremony for the establishment of the Maritime University of Nigeria was performed by former President Goodluck Jonathan but that event was yet to get legislative backing. It is the need to get the institution fully operational in the next few years that triggered discussions on the floor of the Senate.